The idea for this concert was first thought of in 2007 by the two organisers who approached Scunthorpe Male Voice Choir inviting them to present a musical evening, with a guest soloist, in Gainsborough Parish Church, which they agreed to do. The whole evening was to be sponsored so that ticket and programme monies may be shared between three charities with half going to The Royal British Legion (Gainsborough & District Branch) and the rest divided equally between Beckingham Parish Church and Beckingham Village Hall. Lord St. Oswald (who sponsors the Choir), The High Sheriff of Lincolnshire, The Vice Lord Lieutenant of Lincolnshire, The Deputy Lord Lieutenant of Lincolnshire, The Mayor and Deputy Mayor of Gainsborough, the Mayor of Scunthorpe, the Chairperson of Bassetlaw District Council and Directors of Lincolnshire Cooperative Funeral Department all accepted invitations. The latter company was the main sponsor along with Mr John Mannion, the owner of Little London Caravan Park Torksey, to whom the organisers were extremely grateful. More than 30 businesses in and around Gainsborough generously donated to the informative programme. Further thanks went to Ping in Gainsborough who donated a 30th Anniversary limited edition brass putter, to Scunthorpe United who donated a signed football, both being auctioned off at the end of the interval, also to The Hair Gallery and the Chameleon Art Gallery who donated prizes for the lucky programme winners. On the evening of the concert, 19th April, the church was comfortably full including people in the gallery. The concert was excellent with many appreciative comments passed, including suggestions for another, possibly annual, concert. Grateful thanks were expressed to everyone who had contributed in any way to the success of the evening. A total of £1200 was received, £600 for the Royal British Legion, £300 for Beckingham Parish Church, £300 for Beckingham Village Hall. 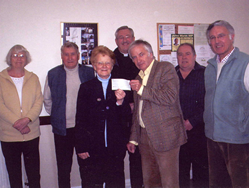 The organisers who are thanked for all their hard work and efforts, presented cheques for the Parish Church and Village Hall at a Coffee Morning in the Recreation Room.